LOWER EAST SIDE — Earlier this month, a brochure posted online gave residents a peek into One Manhattan Square, the 80-story, ultra-luxe tower currently under construction on the East River Waterfont. 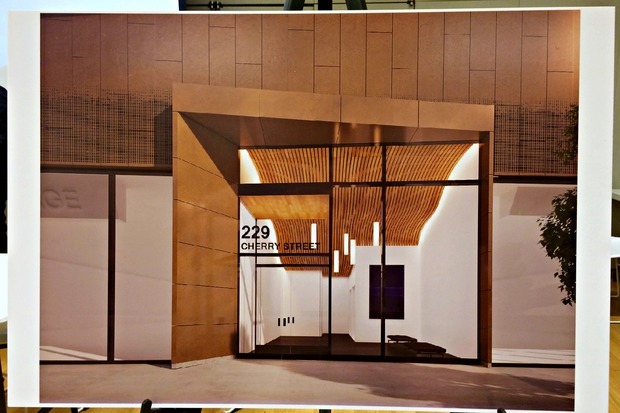 The look of the tower’s counterpart, however — an adjacent 13-story building filled with affordable units — remained under wraps until Tuesday night, when Extell Development Company representatives offered a glimpse of the affordable building during a quarterly community meeting at the Manny Cantor Center at 197 East Broadway. The red brick building will feature 205 units, with one apartment dedicated to the building’s superintendent, said Raizy Haas, Extell’s senior vice president of project management and development. Out of those units, 104 of them will be two-bedroom apartments, 51 will contain one bedroom and 49 will be studio apartments. Half of the units would be earmarked for Community Board 3 residents, giving them a first shot at applying for apartments within the new building, Haas added. 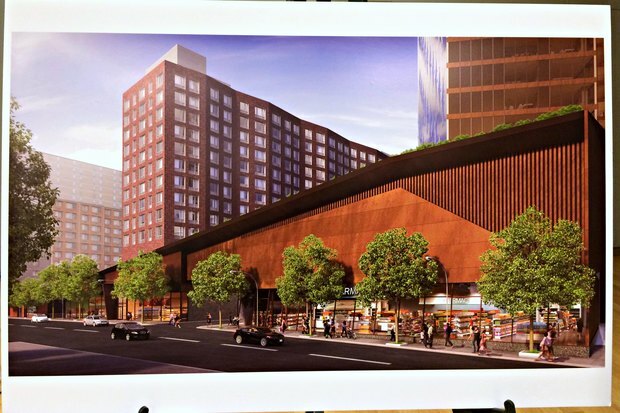 The affordable building will sit next to a proposed supermarket Extell has agreed to build on site to replace the Pathmark it demolished for the project, according to the renderings. A tenant has not been announced for retail space, but Haas said the developer hopes to have the supermarket open by the time the affordable building is complete in 2018. 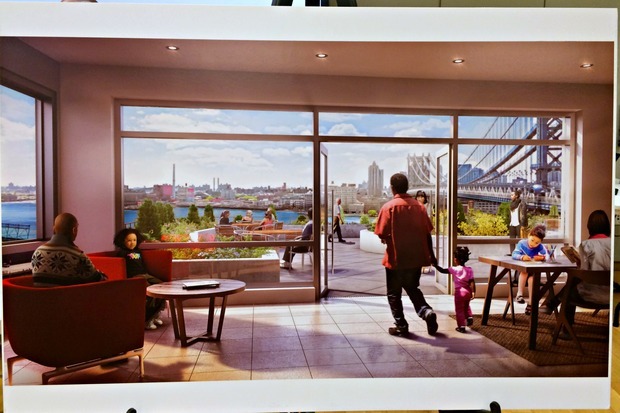 Extell representatives also showed a rendering of the community facility room it plans to build on the top floor of the building, which includes a furnished outdoor terrace, Haas said. She said Extell plans to start construction of the affordable building in September next year and to finish it in early 2018. One Manhattan Square, located at 252 South St., is expected to be completed in late 2019, Haas added.